You are here: Home / Home Decor / Bedroom Closet Organizers That Will Make Your Closet Pinterest Worthy! Bedroom Closet Organizers That Will Make Your Closet Pinterest Worthy! 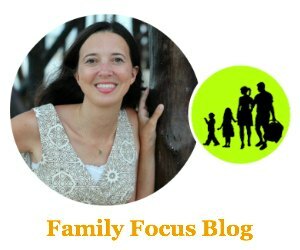 Have you ever seen those fantastic walk in closets with all the rows of shoes, the drawers to hold your treasures out of sight, the wood closet shelving, and the top over bottom hanging? 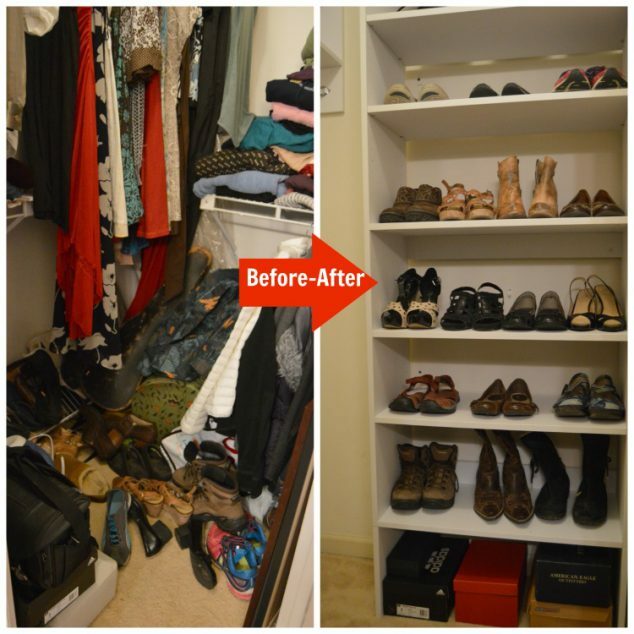 Yes, you know, those closets that leave you longing for such an organized, tidy closet? Well, now you can have one! 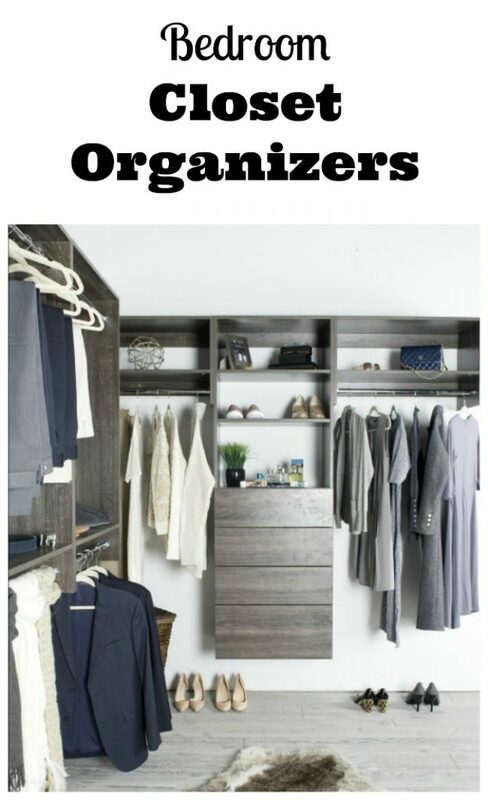 While Modular Closets, can’t give you a bigger closet, they can help you organize it in a way that will make it feel much bigger and look Pinterest worthy! They offer bedroom closet organizers for all shapes and sizes. 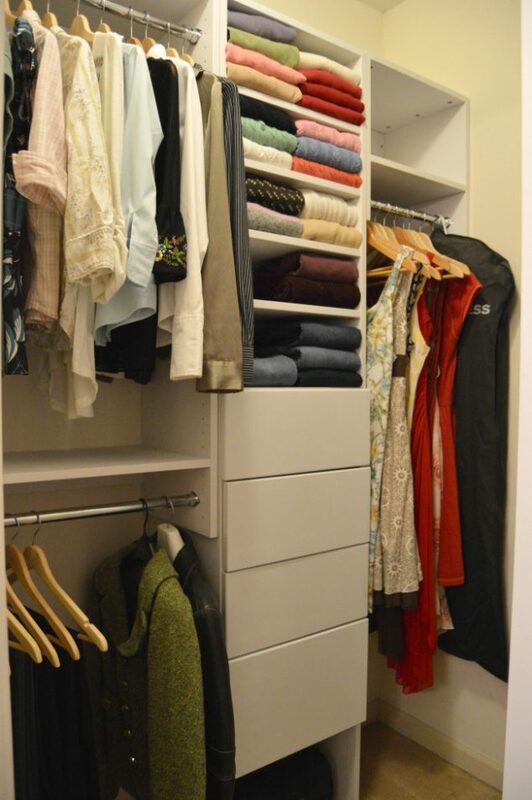 You can chose Modular Closets Systems that will easily make your closet suit your needs. I was provided with Pre-Designed Modular Closet Systems by Modular Closets in order to facilitate review. I received no monetary compensation and the opinions expressed are my own. There is no question in my mind. You are going to love Modular Closets Systems that allow you to design the closet of your dreams with their simple bedroom closet organizers. I know I love mine! When my mom saw my closet after my closet makeover, she said, “Wow, I don’t remember you having such a nice closet!” It makes a huge difference in how my closet looks and in how it functions. We are talking about bedroom closet organizers that make it easy to get organized so you can find just what you are looking for. Your closet will look and feel great when you open that door every single day. The first thing I noticed about Modular Closets is that they allow you to design your own closet using their custom closets systems of modular elements. In other words, this DIY Closet Company lets you chose from standard elements such as wood closet shelving or wood hanging closet sections and mix and match them in the sizes of your choice to create your vision of a perfect closet. Modular closet systems make it easy to create your vision. I started on the Modular Closets modular closet systems page where I was frankly overwhelmed by choice. 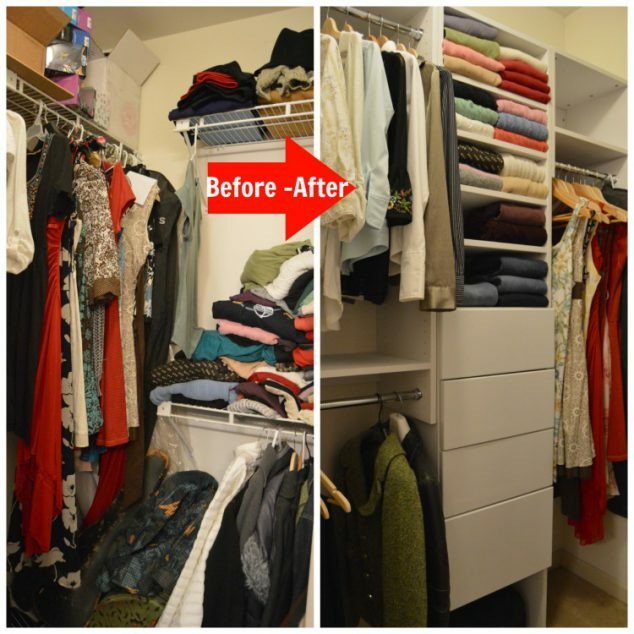 With so many fabulous bedroom closet organizers and wood closet organizer systems elements I was unsure how to design my closet. Then I saw the pre-designed modular closets page and I was smitten. You can find the size of your closet and then see several options that they designed for that size. Modular Closets pre-designed bedroom closet systems make it so easy to quickly identify what you like and then you can add extra closet organizers systems if you happen to have extra space. My closet has a section that is 5 feet long so I chose the 5′ BI-LEVEL HANGING MODULAR CLOSET ORGANIZER WITH DRAWERS & SHELVES. This set up these elements- a single hanging unit, a double hanging unit, and a tower with drawers. Once you receive and assemble the sections, these three elements can be arranged in any order you like. I also got a MODULAR CLOSETS WOOD SHOE SHELF TOWER CLOSET ORGANIZER to use in the extra area of my closet. You probably don’t know this but I used to work in retail management and the Modular Closets shelving systems remind me of the shelving systems we had at my retail stores. In other words, they seem to me to be commercial grade shelves and they work in the same flexible way with shelf pins so that you can change your shelf sizes at any time to fit different items. The closet sections are made from European Birch plywood panels that are 3/4″ thick and a thin wood laminate covering gives the closet panels their sleek, durable outer finish. The pre-assembled drawer boxes are solid wood with dovetail corner joints. The drawer slides have a touch-to-open feature. The pieces of the bedroom closet organizers are fastened by steel Italian cam lock & post. Once you place your order, and your Modular Closets bedroom closet organizers arrive, you can assemble them. The assembly is fairly easy. My 12 year old daughter and I assembled all of my Modular Closets systems together. The only tool required for the entire assembly is a Philips screwdriver. Assembly was super easy once we figured out exactly where to put the Cam Posts. 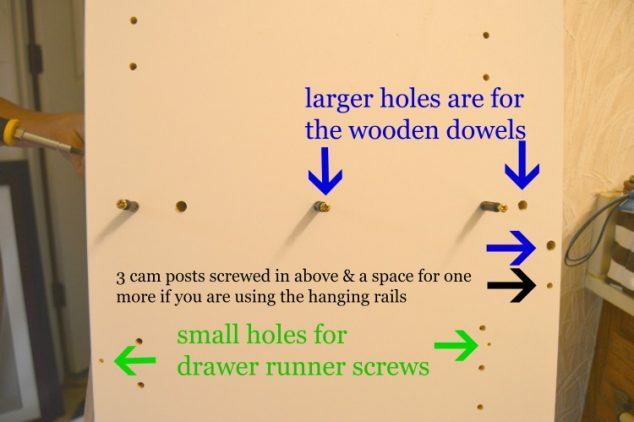 The same mechanism of cam post and cam locks were used for all the closet organizers systems so once we figured it out, we could easily duplicate the same method of Modular Closets assembly. 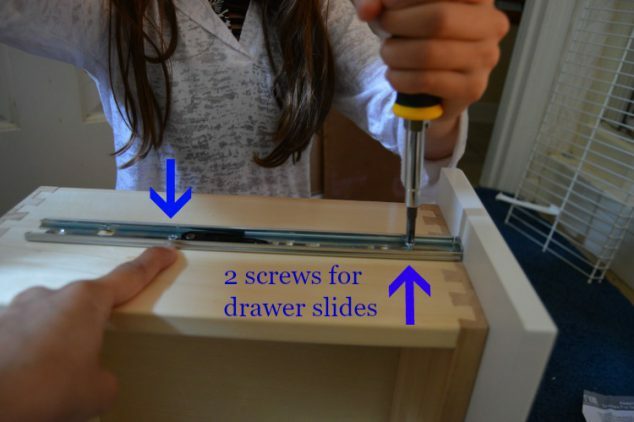 The drawer slides were also fairly easy, once we figured out where to put the screws. Once we assembled the Modular Closets closet shoe rack, we added the optional two 12″ Floor Support Panels and slid it right into my closet for immediate use. Once we assembled the elements of my 5′ BI-LEVEL HANGING MODULAR CLOSET ORGANIZER WITH DRAWERS & SHELVES, we set them aside so that my husband could hang them in my closet by drilling them into the studs. My Closet Makeover Was Pretty Stunning! I also think that the Modular Closets systems would be super useful for organizing my kids’ closets. I would really like to try the MODULAR CLOSETS WOOD SHELF TOWER CLOSET ORGANIZER SECTION to organize my pantry too! The visual difference nice wooden adjustable shelves make verses fixed wire shelves is pretty phenomenal. Visit ModularClosets.com to learn more about your closet options or to place an order. Get more pinterest worthy home decor ideas here. I absolutely love my new Modular Closets bedroom closet organizers. Are you in the market for bedroom closet systems to help you get organized? Do you think the Modular Closets Systems would help your closet appearance as much as it helped mine? Which closet organizers systems is your favorite? Don’t just love the look of the Modular Closet Systems wood closet shoe rack, wood closet shelving, and wood closet drawers?